Gene Chizik was the coach that nobody wanted . . . until he accomplished more than anyone ever dreamed. 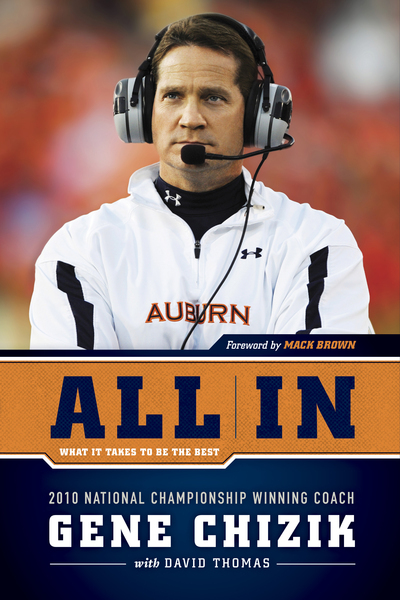 All In chronicles the remarkable journey of Gene Chizik, who in two short years went from being the much-maligned 5–19 coach of the Iowa State Cyclones to the undefeated AP SEC Coach of the Year of the 2010 national champion Auburn Tigers. Coach Chizik shares never-before-told stories about his controversial head coaching career—from his highly contentious departure from Iowa State and his heavily criticized appointment at Auburn to his historic 2010 championship run and all the unexpected twists, turns, tragedies, and triumphs along the way. As he recounts his journey, he opens up about the pivotal role his faith has played in his life and career, and he shares his time-tested secrets to success, both on and off the field. All In is an inspirational must-read for football fans everywhere.